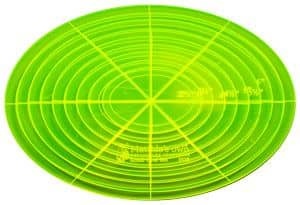 Set includes 9 oval template pieces ranging from 2" to 6" (across widest point) in 1/2" increments. Set includes 9 oval template pieces ranging from 2" to 6" (across widest point) in 1/2" increments. This product may not be in stock and will take approximate 1 week for delivery. If there is a delay we will inform you of this.